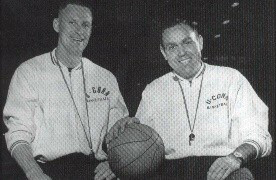 Burr Carlson was a player in the 1951 – 1952 season, an assistant coach from 1964 – 1967, and head coach from 1967 – 1969 at UConn. He’s a member of the All Century Ballot, and was selected by Philadelphia in the 1952 National Basketball Association Draft. I spoke to Burr in July 2004, as he shared some of his basketball experiences, memories, and thoughts on UConn basketball. After graduating from high school, Burr went into the Navy for 10 months. While in the Navy, he grew from 6’4” to 6’6”. He enrolled at Central CT State University for two years. “I always wanted to play for Coach Greer (UConn head coach at the time), because I played against him when I was in high school, while Coach Greer was a coach at the high school level. After graduation from UConn, because the Korean War was going on, and Burr had already served 10 months in the Navy, he was draft able, and had to spend two years in the ROTC program. While a senior at UConn he was also drafted by the Philadelphia Warrior basketball team. They had seen him play in Philadelphia against Villanova when Burr had a pretty good game, and they told him they were going to draft him. Burr had to go back to the service, and was able to play some basketball in the Eastern League in Lancaster, PA where he was stationed, and the Warriors could keep an eye on him. He really enjoyed it. They played on Saturday nights and Sunday afternoons. After his term in the service was done, he was asked to report to Philadelphia to try out for the Warrior team. He couldn’t get a no-cut contract, so he had no guarantee of money or of making the team. He had a wife and a child at this point, and needed a job to support the family. Burr couldn’t take the chance of not making the team, so he did not report to Philadelphia. Instead he got a teaching job for the sixth grade in Rockville, CT. He had asked the superintendent of schools if he could leave and have a job if he had to come back, but Burr was told no, because teachers were in short supply at the time. If things were different back then, and he was guaranteed not to get cut for a year or two, he would have gone. While teaching sixth grade, Burr played with some local teams, but knew he always wanted to coach. He began to coach at Rockville High School, as an assistant coach for baseball, soccer and basketball. He then moved on to Hall High School, then Bristol, as the head basketball coach for four years. Next was UConn where he had the opportunity to work with Coach Fred Shabel as assistant coach of basketball for three years. When Coach Shabel left, Burr became head coach at UConn for the next two years. The scholarship program at the time was not the way it is today; it was based on need. “We just couldn’t make it that way, so I resigned from UConn.” While the previous coach, Fred Shabel was given six no-need scholarships, and able to recruit players like Wes Bialosuknia, Tom Penders, and Toby Kimball, these players had graduated by the time Burr became head coach. “The best player I probably ever had while I was there was Bill Corley. He was a good player. Bill Corley still holds the record for the most number of points in one game. It was against New Hampshire. The Sports Information Director at UConn came to me during the game, and told me that Corley was about six points away from the record. We ran a lot of plays for Bill, and he got the record, and it still stands.” Burr’s record his first year as a coach was 11 wins and 13 losses, and the second year was 5 wins and 19 losses. The scholarship situation really caught up with them. Burr went back to school to get a Master’s Degree in Guidance and secondary administration, and for the next 12 years he worked at Windsor High School before retiring. He then took on a new career working in commercial real estate where he bought, and managed apartment buildings for several years. Now he has retired from the real estate business, and spends most of the year in Naples, Florida. Burr can often be found at the Naples local high school watching basketball games. “In Naples, 1,600 miles away from CT, you should see the people that root for CT, and they aren’t all from CT. They went to other colleges, and when their teams are knocked out of the tournament, they jump on the band wagon, and root for CT.
Burr celebrated his 51st wedding anniversary on July 18 with his wife, Carol, who he said is an excellent wife, mother, grandmother, and was an excellent student graduating from Central CT State University with honors. They have two sons; Ricky opted not to play basketball or baseball when he reached high school. He graduated from Central, works for Travelers Insurance Company, and is married living in Windsor. Gary started college at Assumption, and transferred to the University of Hartford on scholarship. Gary is married with four children. Comparing the coaching styles from when Burr played and coached, to Coach Calhoun, they are very different. Burr said the women play more like the way the men played when he was playing. The women play pass and cut, pass and cut. The men have such physical strength, and speed they dominate the whole game that way. He enjoys watching both the UConn men and women, and he thinks that next season with the returning players for the UConn men, the team is going to be good. 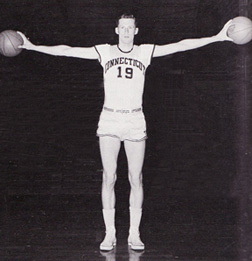 One specific play in a game that Burr remembered, was when his teammate at UConn, Art Quimby, took a rebound, and threw a two hand chest pass the length of the floor to a teammate who layed it up and in. Burr never saw a player do that in his life before or since then, and it was probably one of the greatest things he ever saw. Later as a high school coach he tried to copy that type of maneuver. Off the court there were some fun moments that Burr remembers while at UConn. One was when the guys would do a little horsing around, making noise, trying to get into girls dorms, where they weren’t allowed, and security would come. One night security jumped out of their car leaving it running, the guys jumped in the car and took off. Another fun time was when construction was being done near the dorm, and a bulldozer was left on the property one night. The engineering students from the dorm were able to get the bulldozer going, and as security came, the guys were driving down the street in it.